We always have to make a flight connection when flying to Malaysia. Lately we have been using Narita (Tokyo). We have also used Hong Kong and London. To change things up this time we decided to connect in Australia and take a few weeks to visit Aussie friends that we have met along the way but haven’t seen in a while. We flew from Dallas to Sydney and then to Brisbane (our old stomping ground) and rented a car. We were pretty much beat so got a hotel on the Gold Coast. The next day we visited the Gold Coast City Marina. It’s pretty much the same but most of the employees we knew have moved on to other places. We then headed back north to the Manly Yacht Basin and stayed with Oscar and Graciela on ZENITUDE. It was nice to be back sleeping on a boat even if it was only in the marina. We then headed down to Maclean, New South Wales and stayed for a few days with Steve and Julie of AQUA DREAMS in their new house that they bought after selling the boat. Maclean is a small town on the Clarence River settled by Scottish immigrants. They drove us around and we got a nice tour of Maclean, Yamba, Grafton, and Ulmarra. We then drove about 6 hours south to stay with Terry and Elaine in Diamond Beach for a few days. They sold VIRGOS CHILD and built their house and are now full time dirt dwellers except for the home-built sailing dinghy that Terry built in the garage. We then headed back north to one of our favorite towns on the coast, Crescent Head, to stay with Anne and Al from SAGITAIRE. The boat is now sold and they have replaced it with a camper van to go land cruising. Heading north again, we returned to Maclean for another stay with Steve and Julie. We all drove to Hope Island on the Gold Coast to visit with Julies Mum and Dad. We made contact with Jeremy and Antony on XANTARES and went out to Tuk Tuk Thai Bistro for dinner before heading to the Brisbane airport to catch the red-eye to Kuala Lumpur. It was really nice to be back in Australia again. The people are great, the country is beautiful, and still ranks as our number one best place besides the US to live. By going to Japan in the spring, we thought we would see the cherry blossoms in bloom. Well, we missed it by a few weeks. The next best thing was the Wisteria blooming in Fukuoka. When we arrived at the train station in Kitakyushu it was late, rainy, and cold. We just really weren’t motivated to travel to the Kawachi Wisteria Gardens so we ended up staying in Kitakyushu and touring the Kokura Castle. This one was built around the same time as the Hiroshima Castle, 1600, by Samurai Hosokawa Tadaoki. It also has a moat like Hiroshima but is a much more substantial structure. There is a museum and tea garden on the Castle property. An interesting thing that we learned was that the Shogun (chief of the clan) had a physician whose job was to go through the Shogun's poo from his Chamber Pot and examine it daily. What a crappy job. Okunoshima was a secret chemical weapons facility from the 1930’s until the end of World War II. Residents and employees were not told what the plant was manufacturing. After the war, the Allied Occupation Forces dumped, burned, and buried the poison gas material. There are storage talk cribs scattered around the island and the remains of the power station and chemical factory. The most interesting thing about the island is the wild rabbits. The island was developed after the war as a National Park and rabbits were intentionally let loose. The rabbits have no natural enemies and have bred like, well, rabbits. It is like the Galapagos of rabbits. We easily saw 200 rabbits while we walked the island. They had no fear of humans and seemed quite well fed thanks to the tourism. Some didn’t even want the carrots we bought and had been carrying since the market in Osaka. They didn’t run away like wild rabbits. They mostly just sat there looking at us. They day we went, the weather was beautiful and there was no shortage of visitors. If you go there on a cold or rainy day, the rabbits would surely be more interested in the food you bring. We took the Bullet Train from Hiroshima to Mihara station and then the local Kure Line to Tadanoumi Station. It’s a short walk to the ferry terminal and a 15 minute ferry ride to the island. Ferries run about every hour. 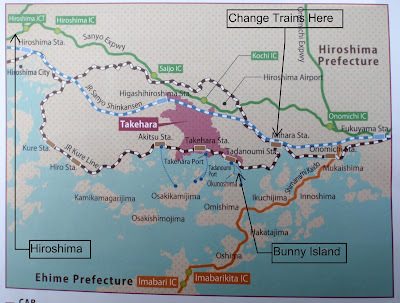 On our way back to the Hiroshima Station, we continued on the Kure Line along the coast and got a much better feel for the coast than we did from the Bullet Train. You would never know that an atomic bomb was dropped on this town except for the monuments and parks in the 1 mile radius that was destroyed by the bomb on August 6th, 1945. Hiroshima is really a beautiful clean city with plenty of tourism, restaurants, and public transportation. The area around the explosion was totally destroyed except 2 main structures, the Industrial Promotion Hall (Atomic Bomb Dome) and the Fuel Rationing Union (Rest House). Peace Park is across the river from the Dome and has numerous memorials and gardens in the park. Phoenix Trees Exposed to the A-bomb – also known as Chinese Parasols, these trees have deep scars from the blast. They were moved here from the courtyard of the former Hiroshima Post & Telecommunications Office in 1973.